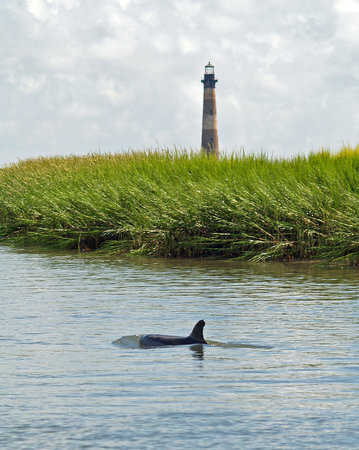 Tours from Sandlapper Water Tours tend to sell out - travelers recommend booking in advance! Thank you for coming out with us! Eddie was one of the best ghost tour guides in town. We hope to see you again in the future! Thanks! It was a beautiful calm night and the city was beautiful all lit up. I liked the ghost stories but couldn’t hear well from front deck. Would recommend sitting inside if you want to hear. Thanks for coming out with us. We are glad you enjoyed the trip. Gotta check those front speakers. 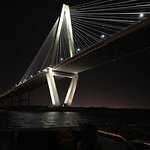 Awesome tour of Charleston's Haunted History from the water! 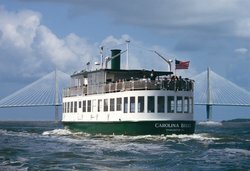 We took the Haunted Charleston Boat Cruise and absolutely loved it! Lee was such a great guide and was very knowledgeable about the city. She had so many great stories to tell and kept everyone entertained and sitting on the edge of their seats:) We had a great time and can't wait until our next visit to Charleston! Thanks again Lee and Sandlapper Tours! Thank you very much for writing a review. Leigh is a great guide and has been with us since 07. She loves it! Thanks for coming out with us and we are glad you enjoyed the tour! Great tour and one of the highlights of our trip to Charleston. The Naturalist was very insightful and inclusive of everyone on board. 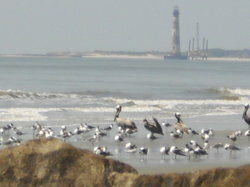 Boating by dolphins, finding crabs in a crab trap and exploring the beach on the island were very fun! We had a great time. Thank you so much for taking the time to write a review. We are glad you enjoyed the tour! We hope to see you again in the future! Great way to see Charleston! 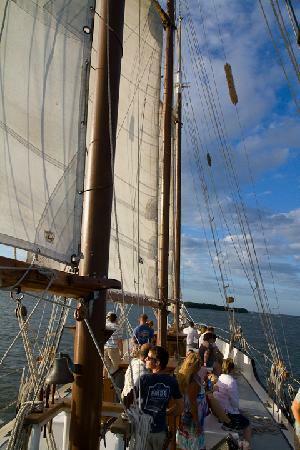 Captain Bryan toured us around Charleston Harbor while local guide, Butler, narrated the sights and sounds. We saw dolphins and birds, got up close to Fort Sumter and the USS Yorktown, and heard stories of what life was like in the 1920s-1940s. Seeing the Battery and church-steeple skyline from the water was a real treat. Boat is comfortable and there is even a bar and restroom on board! Recommend! Thank you so much for taking the time to write a review! We are glad you enjoyed the tour and your stay in Charleston! My wife and I really enjoyed the time out on the cruise of the harbor. There was an almost full moon and perfect weather. Some of the stories about Charleston were very interesting. Thanks for taking the time to write a review. Being out on the water on a full moon is always extra special. We are happy you enjoyed it!